What Defines the Culture of Your Nonprofit Board? The General Motors debacle is fresh in everyone’s minds. A deficit in the company culture was recognized as being responsible for the disaster that resulted in the deaths of 13 people. Board members at GM were obviously not culpable since the board was many levels above the people who were negligent in changing the defective switch. Although nonprofit board members are closer to crisis situations when they happen, a deficit or weakened board culture can frequently be responsible for their occurrence. Often nonprofit staffs are only a level or two away from the board whose obligation it is to see that the mission, vision and values of the organization permeate all levels. 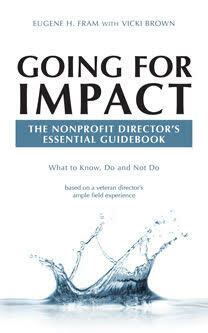 •	Leadership Defines the Culture– Nonprofits are all about group decision-making and the resulting actions or outcomes. The people that sit around the board table making those decisions do so within a framework shaped by protocol and nuance. How the directors act, work together, prioritize and reach consensus consistently defines the organization’s unique culture and may impact its operation.. Newly recruited directors must be prepared to work within this special framework. •	CEO and Management Implement Values-The CEO must convey the existing cultural expectations to job candidates, even to those working at the most routine levels. Oversight personnel should be assigned to look for slippage which, when observed, must be quickly and effectively corrected. On the other hand, a classic Harvard research study on business cultures informally suggests that nonprofits can drive positive cultures by using non-financial incentives, e.g., noting personal achievement, helping people to develop their talents and giving staff a sense of ownership of the nonprofit’s mission, vision and values. * These tools are important cultural motivators for the millennial generation. •	How the Board & Staff Fit Culturally – Nonprofit staffs pay greater attention to the actions and director changes of their boards than their for-profit counterparts because their organizations tend to be “flat” ones. Consequently they are acutely aware that frequent board rotations, typically every three or six years, can change the direction of the nonprofit and their own positions. As a result boards have to demonstrate they are establishing cultural norms by connecting with staffs at celebrations of successes, in board-staff committees and by proactively being involved in other opportunities that present themselves. From a director’s perspective, these venues can help to assess how well the board directed culture is taking hold. •	Communicate, Communicate – A nonprofit should communicate its values and culture both internally and externally—with precision and persistence. Be sure to reward staff that advance the culture— be honest with those who don’t. ** But be sure to spot early signs that cultural norms are being violated, and come to the rescue of your organization and, as in the GM example, the lives of people! *Nitin Nohria, William Joyce & Bruce Robertson (2003), “What Really Works,” Harvard Business Review, July. ← Can A Nonprofit Organization Have A President/CEO & An Executive Director?